Fair enough, I can hear you think: Another coworking space? What’s so special about that? Well, Berlin-based coworking space Blogfabrik charges an interesting price to freelancers in need of a place to work. In exchange for renting a desk, Blogfabrik expects you to deliver at least two publications for DailyBreadMag, their online magazine. In addition, freelancers are being asked to promote the blog and their contributions through their own social media channels as well. Currently, Blogfabrik’s team consists of around 30 people, all with a background in journalism, photography, video or blogging. Blogfabrik is a 555m² playground full of culture and creativity, offering a conference room, cutting room and photo studio. Next to the online magazine, it also hosts numerous events, lectures and workshops related to the freelancers’ activities. Since freelance working is on the rise worldwide, it could be very well that Blogfabrik’s concept, renting a desk in in exchange for content creation, spreads rapidly and will be offered near you any time soon! 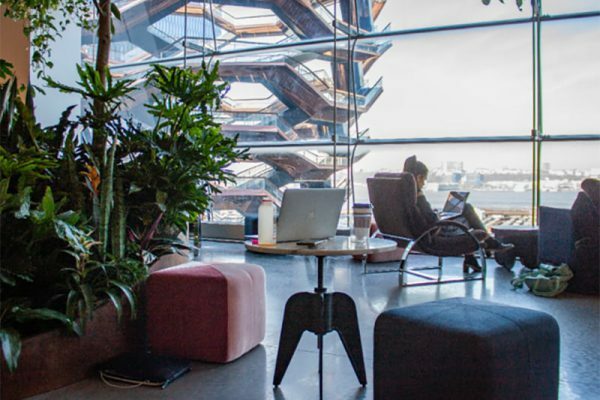 New York-based 3DEN is a new type of urban space that combines co-working with a new range of activities and amenities under one roof.